Stealth Cam Trail Hawk Trail/Game Camera, 16MP photo resolution, video up to 30 seconds, 36 no-glow IR LEDs, 80' range, .8-second trigger speed, inspected, works, like new. Stealth Cam P14 Infrared Trail Camera Kit, 8MP, HD video up to 15 seconds, 14 high intensity infrared emitters, 40' range, burst mode, shoots 1-6 images per triggering, 5-59 sec. / 1-59 min. recovery, turns on, looks new. Stealth Cam PX14X 10MP Trail Camera, 10MP photos and videos, 14 IR LEDs, can be tagged with time, date, inspected, works, looks new. Retina Advanced low-light sensitivity, blacklit LCD screen, intuitive menu programming, inspected, works, used. Moultrie TRACE SG-25 Trail/Game Camera, 12MP photo resolution, records 480p videos, infrared flash, 70' range, weatherproof housing, inspected, works, used. Stealth Cam RX36NG Trail/Game Camera, 10MP photo resolution, records 5-180 second videos, 36 No Glo infrared LEDs with 70' flash, .5-second trigger speed, Matrix Advanced Blur Reduction technology, inspected, works, used. Stealth Cam PX36NGCMO Trail/Game Camera, 10MP photo resolution, records video up to 15 seconds, 36 No Glo IR LEDs with 70' range, 5-59 second / 1-59 minute recovery time out, burst mode takes 1-6 images per triggering, EZ-dial programming, inspected, works, like new. Big Game Eyecon Black Widow Invisi-Flash Infrared Trail/Game Camera, 5MP photo resolution, records video up to 60 seconds, 60 IR LEDs with 50' Invisi-Flash, 1.2-second trigger speed, photo burst mode, inspected, works, like new. Moultrie A35 Trail/Game Camera, 4MP photo resolution, 32 long-range infrared LEDs, inspected, like new. 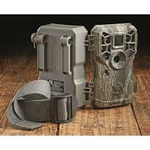 Moultrie Game Spy 2 Plus Game Camera, 9MP photo resolution, 24 IR LEDs with 50' range, inspected, works, like new. 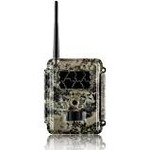 HCO Spartan Verizon GoCam 3G Wireless Blackout IR Trail/Game Camera, 8 MP, sends photos directly to your smartphone, 45 invisible blackout IR LEDs with 60' flash range, inspected, turns on, light use. Performance Tool 2-million Candlepower Rechargeable Spotlight, quartz halogen bulb, ABS housing, inspected, works. 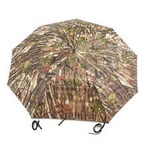 Pair of Guide Gear Camo Umbrella Blinds, vented top, 54" diameter, looks new. Guide Gear Stereo Hearing Protection Earmuffs, automatic sound activated suppression, noise reduction rating of 24 decibels, adjustable design, inspected, looks new. Belgian Police Surplus Leather Tactical Gloves, leather with Kevlar palm, padded knuckles and backing, hook and loop closure belt at wrist, Lg, inspected, like new. 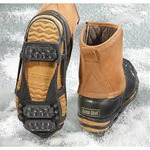 Three Pairs of Ice Cleets, STABILicers Walk Ice Cleats sz L, Surplus Flexible Crampons sz 11, Yaktrax Chains Sz XL, like new. G5 Small Game Fixed Blade 100-Grain Broadheads and Rage X-treme 4-Blade Broadheads, 2 Pack, like new. Wildgame Innovations 6V Solar Panel, aluminum mounting bracket, steel flex conduit, alligator battery clips, looks new. NATO Surplus Flak/Stab Protection Vest, NATO issued, nylon with Kevlar panels, Kevlar panels in zip-out pockets, Kevlar shoulder/neck areas, looks new. HuntRite Long Beard Lounger Seat, steel frame, 300 denier polyester mesh seat, folds for storage, adjustable shoulder strap, new. US Military Magnesium Snowshoes, nylon-coated aircraft steel cable, cleats, 12 x 47", 5 lbs. US Military Magnesium Snowshoes and Binding, nylon-coated aircraft steel cable, cleats, bindings, 12 x 47", 5 lbs, used. US Military Magnesium Snowshoes and Bindings, nylon-coated aircraft steel cable, cleats, 12 x 47", 5 lbs. Lot of 3 U.S. Military Surplus Duffel Bags. HQ ISSUE LED Headlamp, 540 Lumen, and Sightmark Magnetic Universal Boresighter, not inspected, look new. 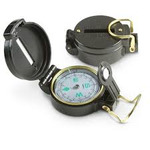 Mission First Tactical AR-15 Flip-up Front Sight, 1/4 MOA, and Pair of Military-Style Lensatic Compasses, new. Firefield Crossbow Laser Sighting Tool, and Guide Gear Leather RFID Wallet, Tri-fold, built-in RFID blocking material, new. British Military Surplus Snow Shoes, complete. Guide Gear Flex Trek Snowshoes, aluminum powder coated frame, polyurethane decking, aluminum cramp, new. US Military Magnesium Snowshoes and Bindings with US Military 49'' Trekking Poles, nylon-coated aircraft steel cable, cleats, bindings, 12 x 47", 5 lbs, like new. Stealth Cam PX14X 10MP Trail Camera, 10MP photos and videos, 14 IR LEDs, can be tagged with time, date, inspected, works, new. Stealth Cam SD Memory Card Photo Viewer, 4.3" color LCD screen, playback with pan and zoom functions, rubber trim, mini USB connection, brightness and volume, inspected, works, new. U.S. Military Surplus Load Bearing Vest with Canteen, and U.S. Military Surplus USMC Assault Pack, used. 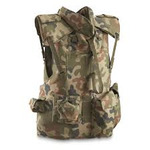 British Army Surplus Rucksack, and HuntRite Camo Hunting Pack, used. Moultrie 55 gallon Feeder Drum and used Moultrie Econo Plus Feeder Kit, parts only, not complete.